Not to be confused with Croan, Crohn, or Krone (disambiguation). Look up crone in Wiktionary, the free dictionary. The crone is a stock character in folklore and fairy tale, an old woman. In some stories, she is disagreeable, malicious, or sinister in manner, often with magical or supernatural associations that can make her either helpful or obstructing. The Crone is also an archetypal figure, a Wise Woman. As a character type, the crone shares characteristics with the hag. The word "crone" is a less common synonym for "old woman", and is more likely to appear in reference to traditional narratives than in contemporary everyday usage. The word became further specialized as the third aspect of the Triple Goddess popularized by Robert Graves and subsequently in some forms of neopaganism, particularly Wicca in which she symbolizes the Dark Goddess, the dark of the moon, the end of a cycle. In New Age and feminist spiritual circles, a "Croning" is a ritual rite of passage into an era of wisdom, freedom, and personal power. As a noun, crone entered the English language around the year 1390, deriving from the Anglo-French word carogne (an insult), itself deriving from the Old North French charogne, caroigne, meaning a disagreeable woman (literally meaning "carrion"). Prior to the entrance of the word into English, the surname Hopcrone is recorded (around 1323–1324). In Joseph Campbell's classic work The Hero with a Thousand Faces, the first encounter of the hero on his journey is with a protective figure who provides him with amulets or magic devices against the dangers he will face. The crone is one of the most common of these protective figures. Campbell links the "helpful crone" to the fairy godmother. The wicked fairy godmother sometimes appears in the guise of a crone. In Norse myth, Thor wrestles the crone Elli who personifies old age. 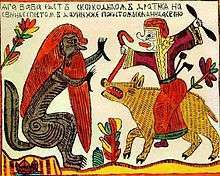 The Slavic witch Baba Yaga is a crone and liminal guardian to the Otherworld. In the local folklore of Somerset in southwest England, The Woman of the Mist is said to appear sometimes as a crone gathering sticks; sightings of her were reported as late as the 1950s. In the Scottish Highlands tale "The Poor Brother and the Rich," a crone refuses to stay buried until her son-in-law provides a generous wake, after which he becomes as wealthy as his more fortunate brother. ↑ Based on a Google search of "crone" (2,510,000 hits) and "old woman" (about 16,700,000). Additional data from a search of the New York Times archives since 1981 which yielded 9100 results for "crone" and 10,023 for "old woman"; in the period 1851–1980, 4,137 for "crone" and 12,270 for "old woman." Searches did not sort out the surname "Crone," nor the construction "N-year-old woman." Retrieved 29 March 2009. ↑ Joseph Campbell, The Hero with a Thousand Faces (orig. pub. Princeton University Press, 1968; 3rd ed. 2008), p. 57 online. ↑ Campbell, The Hero with a Thousand Faces, p. 280. ↑ Campbell, The Hero with a Thousand Faces, p. 59. ↑ Jane Chance, Tolkien and the Invention of Myth (University Press of Kentucky, 2004), pp. 153–154 online. ↑ Roy G. Willis, World Mythology (Macmillan, 1993), p. 209 online. ↑ Katherine Mary Briggs, The Fairies in English Tradition and Literature (University of Chicago Press, 1967, 1989), p. 41 online. ↑ J.F. Campbell, Popular Tales of the West Highlands Orally Collected (London, 1890), vol. 1, pp. 237–240 online, full text downloadable.